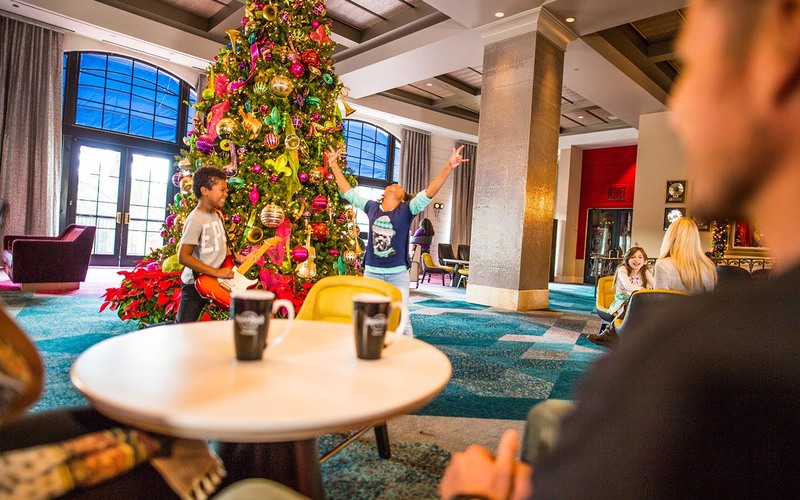 There are so many ways to enjoy the holidays at the five on-site hotels at Universal Orlando Resort. Below is a full list of holiday festivities at Universal Orlando’s hotels to make your holiday visit even more memorable. Indulge in the flavors of Italy for Thanksgiving and Christmas. 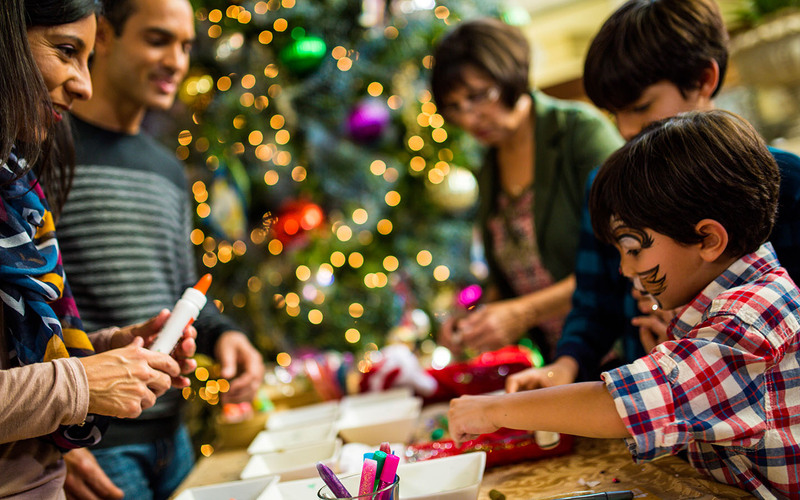 In addition, eajoy appearances from Universal characters, holiday crafts, face painters and more. Holiday Harbor Nights — Nov. 25, 6:30 – 9:00 p.m. 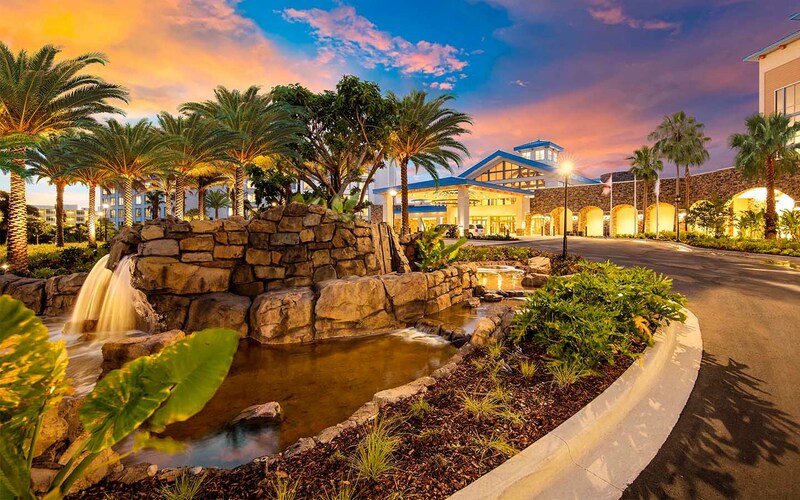 Kick off the holiday season by enjoying delectable gourmet food and wine, all while taking in the picturesque surroundings of the Harbor Piazza. 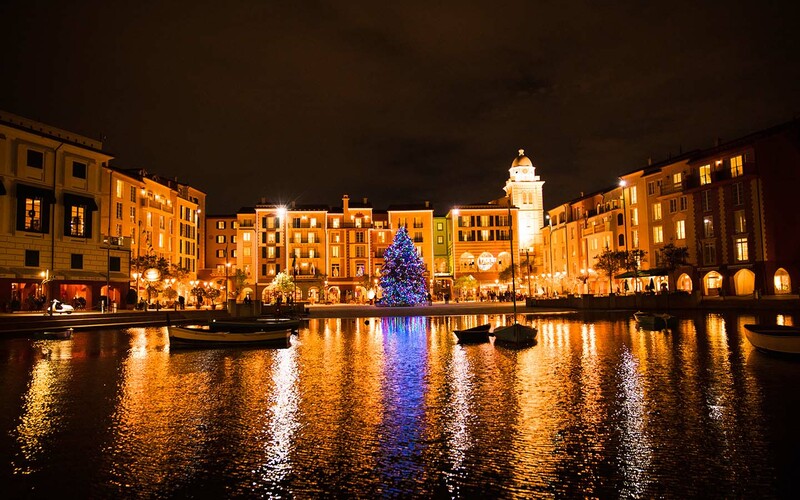 Plus, don’t miss the grand illumination of the Portofino Bay Hotel’s Christmas tree. Special Visits from Santa & Mrs. Claus — Dec. 19 – 24, 6:00 – 9:00 p.m.
Come visit the North Pole’s finest before they start their journey across the globe for Christmas. 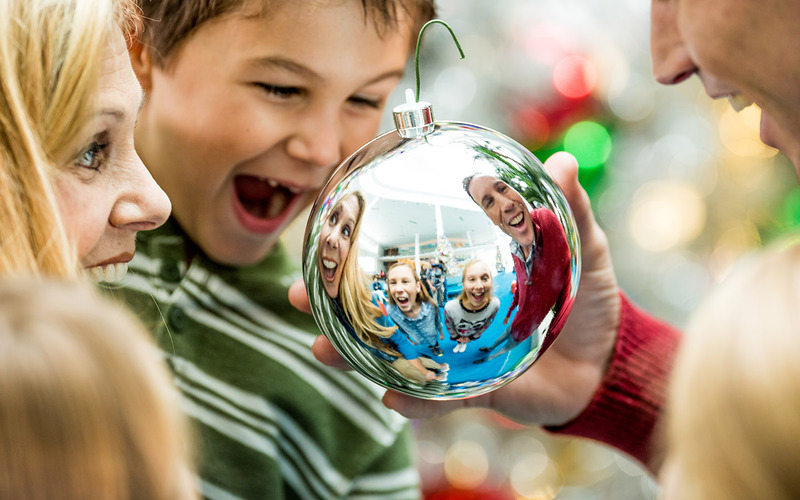 You’ll be able to take your own photo with Santa or get a professional photo taken for an additional cost. Countdown to the New Year with delightful food and wines, amazing live music, a midnight toast and more. Rock-in 2017 New Year’s Eve Lobby Party — Dec. 31, 8:00 p.m. – 1:00 a.m.
Ring in the New Year like a rock star! This family-friendly party will feature specialty desserts, Universal characters, a DJ, a balloon drop, champagne toast and more. 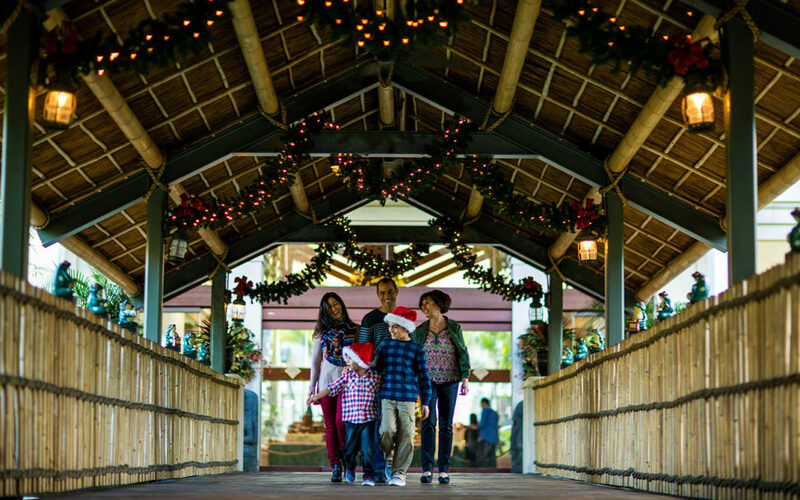 Enjoy feasts with island flair for Thanksgiving, Christmas and New Year’s Eve, complete with appearances by Universal characters, hula dancers and more. Celebrate the holidays with a journey to the islands and a luau. Includes a buffet of delicious tropical food, fire dancers, hula dancers, live music and special holiday touches. Orchid Court Lounge New Year’s Eve — Dec. 31, 7:00 p.m. – 1:00 a.m.
Savor the New Year with sweets at Orchid Court’s dessert party. You’ll enjoy a special dessert buffet, live DJ, streaming of the ball drop and champagne toast at midnight. Free when you join us for our New Year’s Eve buffet in Islands Dining Room. Step back in time at Bayliner Diner with a special holiday menu for both Thanksgiving and Christmas. Tree Lighting Ceremony — Nov. 25, 6:30 – 8:00 p.m.
Get in the holiday spirit by celebrating as the Christmas tree in Cabana Bay’s lobby lights up for the holidays. There will be a cheerful tree lighting ceremony, featuring a special guest appearance, hot chocolate and cookies, live music, face painters and more. New Year’s Eve at Bayliner Diner — Dec. 31, 8:00 p.m. – 12:30 a.m. This New Year’s Eve, take a trip back to the 1950s and ‘60s with a scrumptious meal, a live DJ, face painters and a midnight balloon drop! Celebrate the holidays in paradise with a delightful buffet for Thanksgiving, Christmas and New Year’s Eve. There will be entertainment including Universal characters, face painters and more. Tree Lighting Ceremony — Nov. 25, 6:00 p.m.
Join in to watch as the Christmas tree in the lobby lights up for the very first time! There will be live steel drum music, hot chocolate, hot cider and cookies for all to enjoy! Feeding Children Everywhere — Nov. 26, 9:00 a.m. – 1:00 p.m.
Take an hour or two to volunteer your time with us and Feeding Children Everywhere. The goal of this amazing project is to assemble 350,000 meals across all five hotels for those in need. Click here to sign up with Feeding Children Everywhere (select your hotel at the bottom of the page). 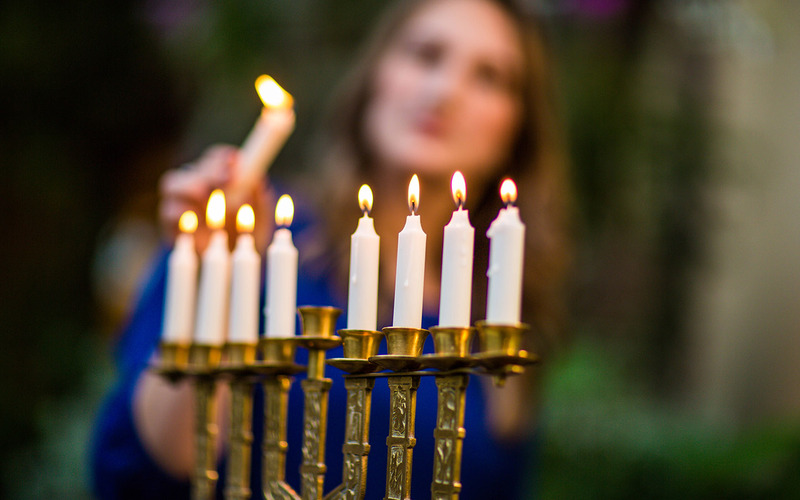 Each hotel will light a candle on the Menorah on each night of Hanukkah. Check with the front desk for nightly times. You can find all the pricing, reservations and a full list of the holiday festivities at our on-site hotels right here. Happy Holidays!